Craig Jones posted this photo of Arfee on his Facebook page. For the Coeur d’Alene Police Department, the dog days of summer have been less about the weather than the heat over its closely watched investigation of a police officer’s fatal shooting of Arfee, the black Labrador left inside his owner’s parked van. The controversial shooting five weeks ago has overshadowed every other story in the Lake City this summer. Police and city leaders have been bombarded with questions, condemnation and profane rants from near and far. The name of the officer has not been revealed over concern for his safety. The city’s use-of-force investigation has been slowed by a delay in gaining access to the van, an uncooperative eyewitness and city employee vacation schedules. In addition, the officer did not turn on his body camera before approaching the van, leaving investigators with no video of the shooting. Police say they are nearly done with the investigation, and that report – around 300 pages long – will be reviewed by three internal police officials and one outside police official, with a final evaluation by an independent use-of-force expert, probably someone from outside Idaho. All that could take several more weeks to complete, the city said. The department is moving as fast as it can while still being thorough, said Ron Clark, the interim police chief, and he hopes the public welcomes that. “I would think they’d want it investigated properly and also to its fullest – make sure that we do the right thing,” Clark said. Mayor Steve Widmyer said he’s eager to have the facts and findings come out, but he also wants it done right. After Labor Day a new police chief, Lee White from Mesa, Arizona, will assume command of the Coeur d’Alene Police Department. He will inherit the Arfee aftermath and direct how his shop accounts for the shooting and the backlash police have endured this summer. “He’s going to have a big job ahead of him, because there’s been some damage to the reputation, and I think that’s really important that we make sure people have trust in our PD,” Widmyer said. Even before the shooting investigation wraps up, officials concede they can do a better job in handling encounters like the one with Arfee. Craig Jones, who is from Coeur d’Alene but now lives in Colorado, parked in the shade behind the Java coffee house on Sherman Avenue the morning of July 9 while he ducked inside for breakfast. 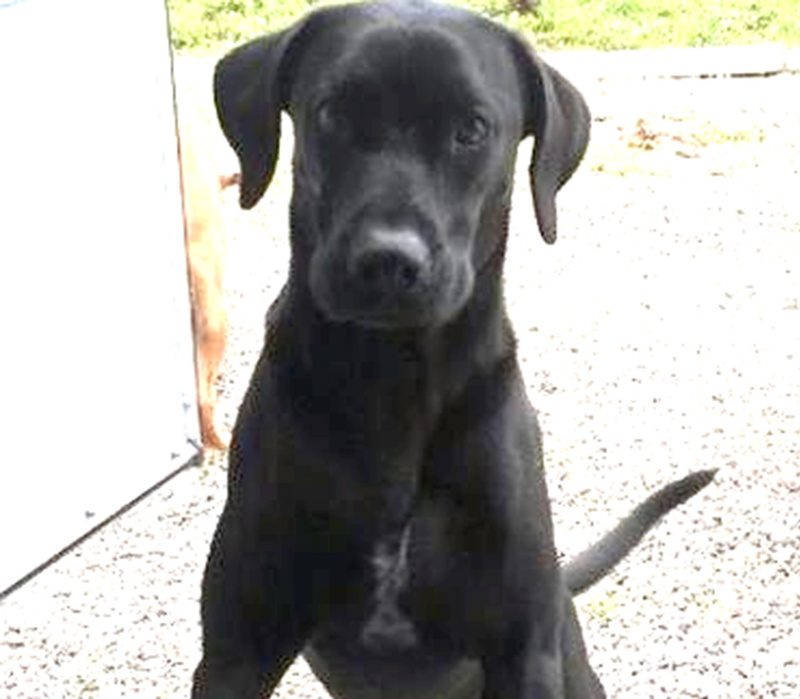 He left Arfee, a 2-year-old black Lab, in the van with the window partially rolled down. Two officers investigating a report of a suspicious van in the area approached Jones’ vehicle around 11 a.m. to check it out. The officer on the driver’s side encountered Arfee lunging through the window, according to the city’s initial report. The officer fired, striking the dog in the chest and killing it, while his partner was on the other side of the van. Officers removed the dog’s body, left a note on a business card for the owner and departed without making contact with Jones, who returned a short time later to find a bullet hole through the window, Arfee missing and blood inside the van. An officer should have stayed with the van until Jones returned, Widmyer said. “Not finding that owner is inexcusable,” he said. Another misstep was the wording of a news release that police sent out shortly after the shooting. It said “a vicious Pit Bull dog lunged out the open driver’s side window toward the officer’s face.” The next day, Clark issued a news release correcting the breed as a Lab mix. City animal control officers had misidentified the dog in the van, and a veterinarian later made the positive ID, officials said. The police department launched a use-of-force investigation to evaluate the officer’s conduct in drawing his weapon and firing into the van. But the investigation also is examining what officers did afterward, including their efforts to track down Jones, the decision to leave him a note and even the wording of the news release. Usually when an animal is put down by an officer, a full-scale investigation does not follow. This case is unique, Gridley said. And it has been more complicated than city officials expected. Clark said he hears people asking why the investigation is taking so long. Part of that is beyond the control of investigators, he said. Jones, the owner of the van, declined to comment, and a message left with his Bellingham attorney, Adam Karp, was not returned Thursday. Public indignation over the shooting of Arfee has been intense. Many messages sent to police and City Hall demanded the officer be fired or charged with a crime. Clark, the interim police chief, said someone went as far as to track down his own home address and post it online. The department conducted a threat assessment of some of the more vitriolic messages, but “I don’t think any of them have risen to a point where we can actually investigate it as a crime,” Clark said. Police had planned to release the name of the officer soon after the shooting, but once the backlash and threats began, they decided to wait. Officials have not yet decided when they’ll disclose the officer’s identity, saying it depends on when the threats subside. The longer the investigation is drawn out, the more the public grows impatient and suspicious, city leaders acknowledge. “My viewpoint would be more inclined to get all of the information out, because I think the longer it’s not out, the longer it feeds various cover-up, conspiracy theories,” Gridley said. The city recently refuted rumors a second shot was fired, he said, and that the officer may have deleted his own video footage of the incident. The officer admitted he did not turn on his body camera before the shooting, but he did record an unrelated interaction earlier in the day as well as a bystander interview immediately after the shooting, city officials said. There is no gap in the video file log, and no way the officer could have deleted anything at the scene, Gridley said. In addition to reinforcing department policy on the use of body cameras, police are reviewing other procedures, including how they describe animals in reports. Instead of trying to identify a breed of dog, for instance, it might be better to just note the animal’s size, weight and color, Gridley said. The department is ready to account for the mistakes it made that day, Clark said.